All of our dogs at Pets with Disabilities are disabled. They are the dogs that are overlooked because of “the defect” people see on the outside - people typically aren't willing to take the time to see the wagging tail of the deaf dog chasing the ball across the yard, or the blind dog going up a flight of stairs to get the treat or hug they know is waiting for them, or the 3 legged dog run like the wind with their friends in the joy of living. As you read their stories - be prepared to make a "Heart Connection" with one or more. They each have their own unique gifts of joy and love of life. 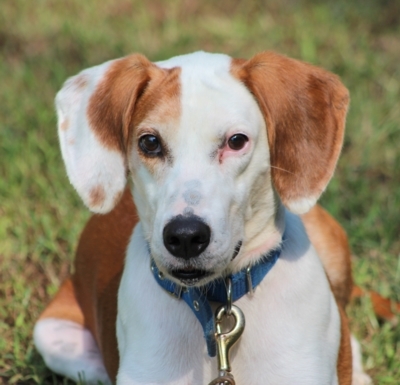 Pets with Disabilities is we are located in Southern Maryland. Please email us for additional information concerning a specific dog - the adoption process will begin with a completed application. 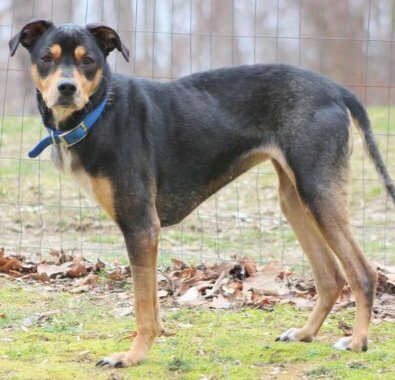 Meet Lola, a 3 legged, extremely smart and very obedient 9 year old doby/hound mix. Lola weighs about 40 pounds. Please don’t let her age deter you from coming to meet her! 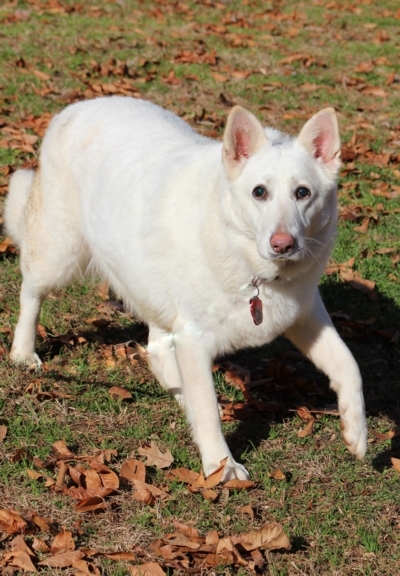 She is quite spry for an older girl still lots of pet in her step! 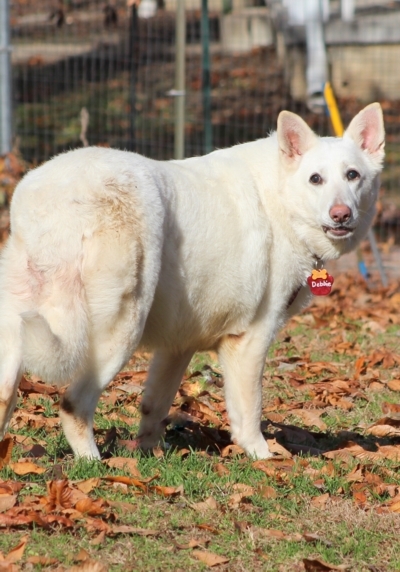 Lolo's life turned upside down when her fur mom died and she had to be rehomed. She ran away and was severely injured, and landed in a very overcrowded shelter. Her leg needed to be amputated. She easily acclimated to life on 3 legs! She has great manners, knows basic commands and will be a very loyal companion, and loves the comforts of a nice cozy dog bed. She is good with other dogs and cats! 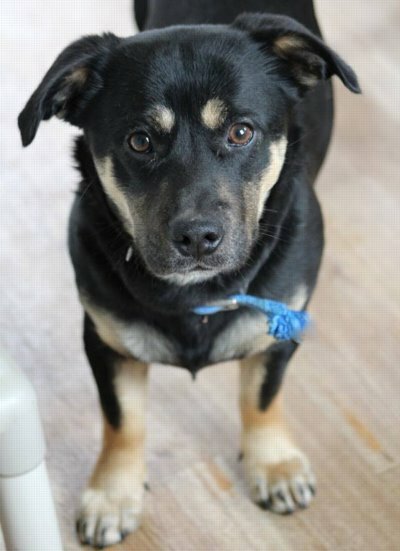 Lola would make an easy addition to most any home. Will you make a heart connection with Lola? 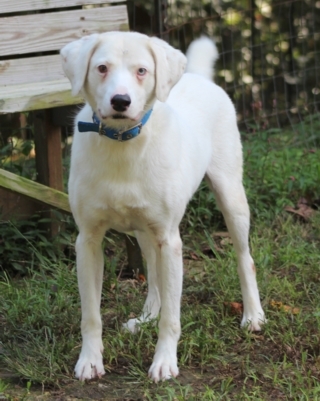 Lilo came to us from a very busy South Carolina shelter where he was on the euthanasia list due to a rear leg injury. He is a 1-2 year old Corgi mix. His injury will be evaluated by our Orthopedic team to see how we will proceed. He is adjusting well to life here. He was cautious at first but his little personality is beginning to show. 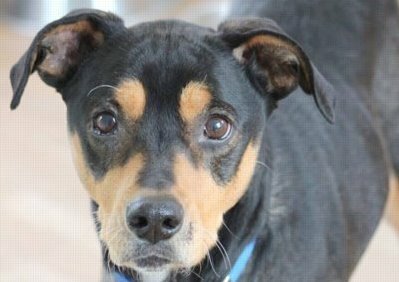 He is a cute little guy who will be looking for his forever home very soon! 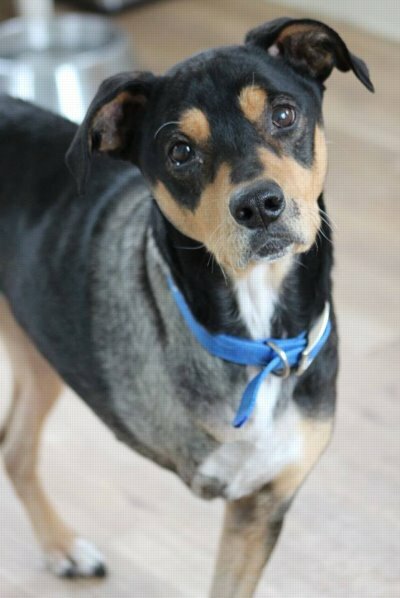 Will you make a heart connection with Lilo - he needs several? 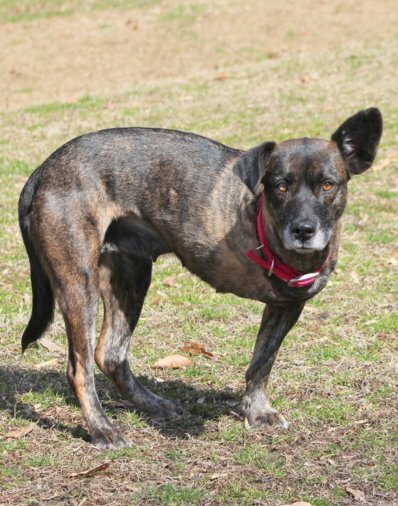 Meet Cocoa, a 3 legged, 40 pound, 5 year old Plot hound mix. She came to us from a rural NC shelter where she was found as a stray mom with a litter of puppies. Although she sustain a painful injury she was a good mom, and all her puppies were adopted. She now needed medical care, her front let needed amputation. Coco was in a loving foster home during her recuperation and we got a little snippet of her personality. "Cocoa was extremely shy and scared after her major surgery and reluctantly entered her crate that she initially refused to leave. After sitting in the floor with her for over an hour, treats and food enticed her out of her safe space. She was submissive and calm with all my other babies and they loved her from the start. She almost played with them a few times but they are both larger and she was still learning to walk again. I realized that her crate was unnecessary and she staked out her favorite dog bed. She was immediately drawn to my 11 year old grandson and was by his side constantly when he was here. The same thing happened with my friends. As soon as people settled in a comfy chair or on the sofa, she wormed her way into your lap for petting with no assistance. She is such a loving girl with some trust issues that stole my heart. Someone has mistreated this baby and that makes me sad. Her loss if her leg has not affected her mobility as much as one might think since she will move very quickly when food is offered. 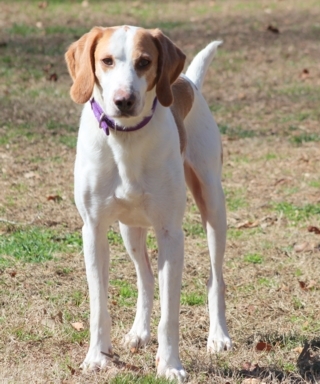 She will be such a loyal companion in a loving home." 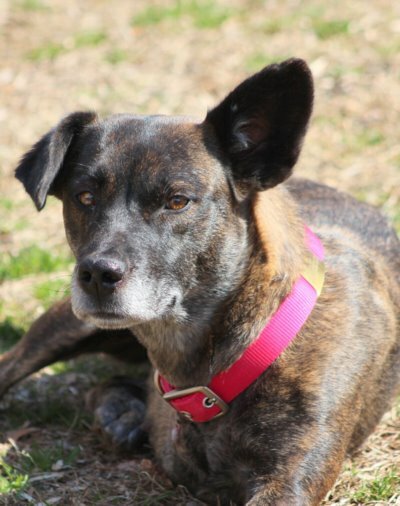 Cocoa is now spending her days at PWD waiting for her forever family. She really is a stunningly beautiful girl with a gentle personality. She loves her bed and belly rubs! Cocoa does need some leash training but with some patience, trust, and treats we think she will get the hang that taking walks with her human will be a fun! We all need a little Cocoa therapy in our lives and she is definitely the one! Will you make a heart connection with Cocoa? Duchess found a Heart Connection with Millie Groobey - thank you! 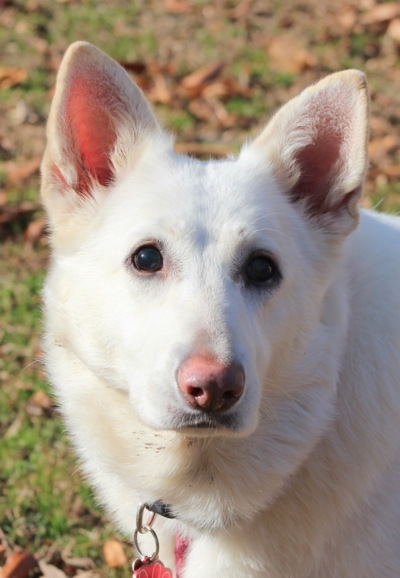 Duchess is a two year old, blind, white German Shepherd. She was born blind and has lived her entire life in an isolated, filthy, chain link kennel in California, along with 40 other dogs that were rescued. It was heart breaking to find out Duchess had been left behind, due to her disability, while so many of the other dogs were on their way to a better life. PWD was contacted and raised the funds to fly her from California to Maryland, in early December. She is now in a fabulous/experienced foster home and is adjusting slowly to a more controlled home environment. She is doing great and making daily progress. We think she did pretty much anything she wanted to for the past 2 years, so this has been quite a change for her. She is enjoying all her new canine and feline friends but is a bit unsure of humans. We will give her the time she needs to learn that humans are part of her world now. Duchess is not available for adoption yet as we continue to learn a little bit more about her and how she settles in a home. 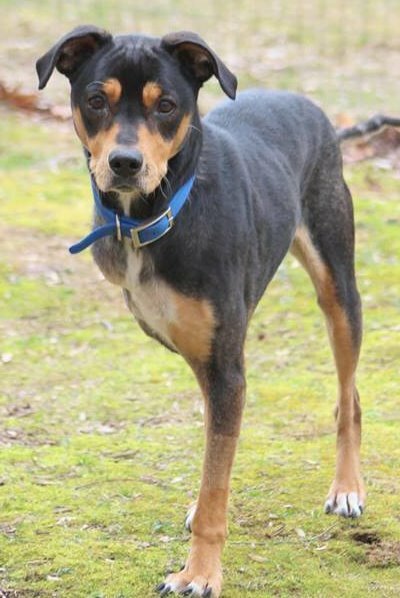 Will you make a heart connection with Duchess? Meet Princess, a 7 year old 60 lbs. 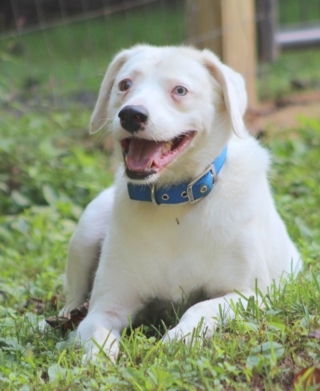 Aussie/lab mix who is deaf. Princess found herself in a rural Virginia Shelter after her fur mom passed away. She is an extremely smart and loving dog. Although she is deaf, she is alert and very tuned into her surroundings. Her recall is phenomenal, when we need her to return to the barn and settle in her apartment she returns quickly with just a simple hand command. TEMPORARILY UNAVAILABLE: Princess has returned for a medical evaluation. We will update her bio in the near future. Charity Hix has a Heart Connection with Molly - Thank you!! 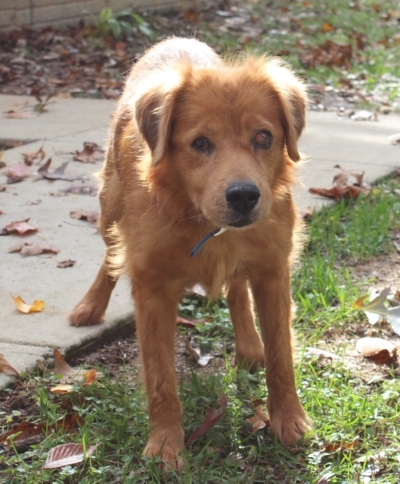 Molly is a 10yr old blind dog that came to us from a shelter in West Virginia. 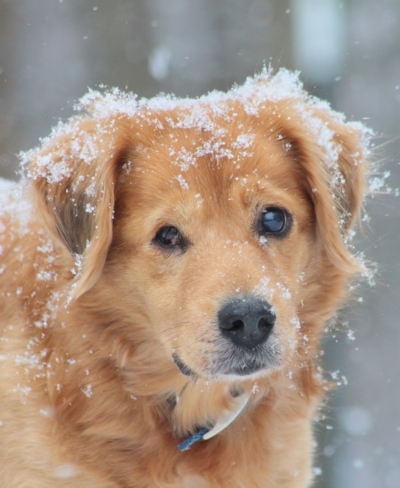 Molly's plea was sent out to MANY rescues, but all rejected her due to her age and disability. Finally PWD was contacted and we couldn’t turn our back to this cute pup. Molly is a survivor, only weighing about 20 lbs. when picked up by animal control. She was blind, malnourished and so weak, she could barely walk. Finally after some much needed TLC she gained weight and strength, and her mobility has returned to almost normal. Her personality has blossomed too. She is good with other dogs, but due to her history she is a little fearful of them getting into her bubble. She loves her bed, food time, and when outside loves to snuggle in a bed of leaves, comforts she has never experienced. We think that one level living in a quiet environment would be best for her. She is a quiet easy pup to manage, she sleeps a lot. 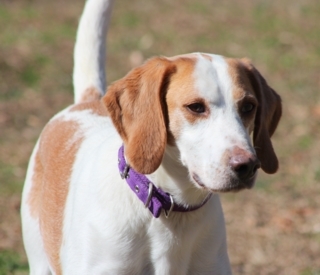 She can be placed with other dogs, but they should be patient and tolerant with her. We can't erase history for Molly but we can make her future bright, safe and trusting! She is in need of a "heart connection". 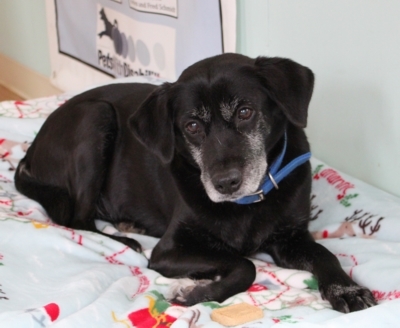 HOSPICE FOSTER HOME FOUND: We continue to admire the hearts of "good people"! 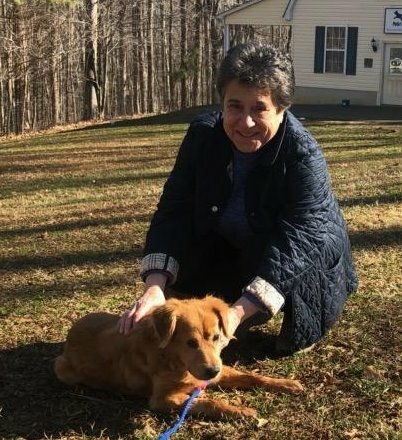 Molly's foster mom followed the website for over a month and finally felt compelled to come meet her when the request for a special foster home was posted. 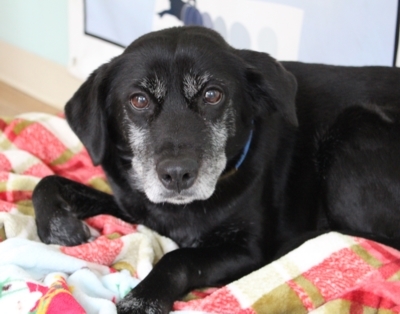 Even with all of Molly's health concerns this kind woman had no hesitations to take her home. We all believe this is Molly's first real home, and she still seems a bit bewildered with her new surrounding but "she is discovering what wonderful things live in kitchen cabinets" and that the "big cold box" has lots of food in it. Molly still naps most of the day and has a cute little snore!" A big heartfelt thank you to Molly's foster mom for opening her heart and home to Molly. We know they will have a wonderful journey together - one of love and understanding. 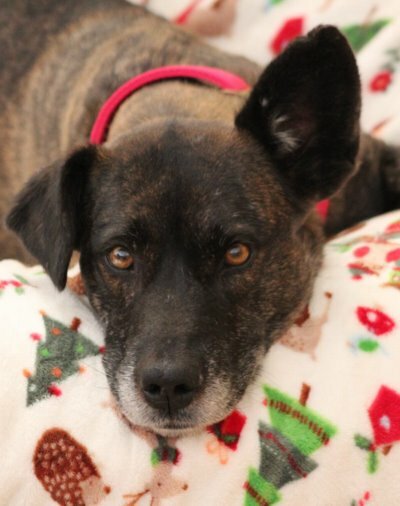 Molly is still in in need of Heart Connections, as PWD will still be very involved with Molly's health and taking care of her medical bills. 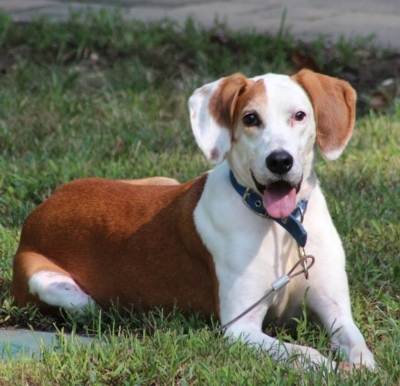 Bishop is a handsome 4-5 year old lemon hound, who is deaf. He was surrendered to one of our Virginia shelters we partner with. 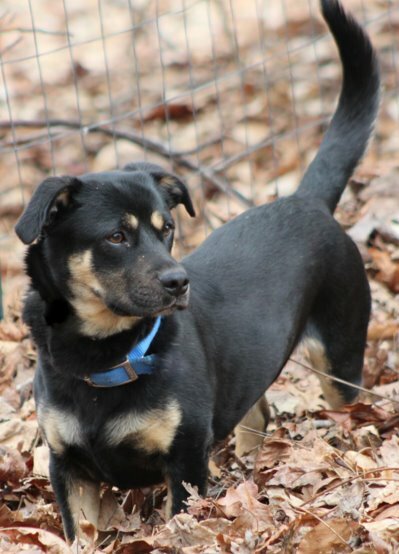 He is about 50 lbs., fun, active, goofy pup, that will put a smile on your face. He loves attention, and will curl up and lay on just about anything. He has flourished here at PWD and has made many new friends here. 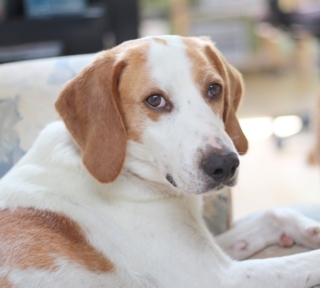 A sweet gentle soul good with people, cats and great with kids. However, Bishop has some possession issues with other dogs and so we do feel he does needs to be an only dog. 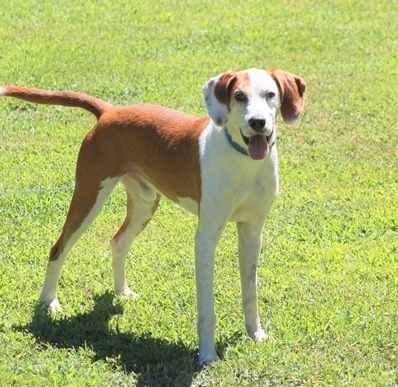 Bishop would do great in a secure area or leash walking. Will you be Bishop's "heart connection"? 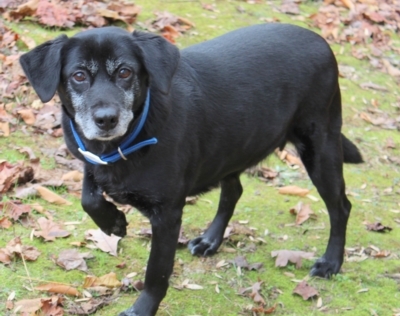 Betty Bee is a 9 year old 40 pound black lab/beagle mix. Betty was another stray that landed in one of our neighboring shelters. We were asked to rescue Betty and treat her non weight bearing right front leg. After evaluating all her medical needs, our veterinary team determined her dental needs far outweighed the need for an amputation. (Amputation was deemed unnecessary as she gets around just fine with her bum leg) Betty had major dental disease and underwent $3000 worth of dental reconstruction and many teeth removed. Finally, her mouth is now disease free and pain free. 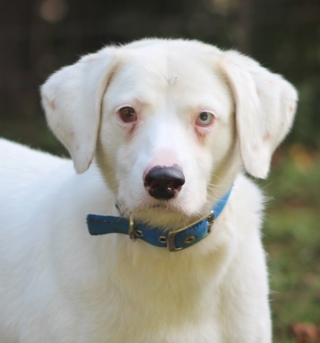 Betty is an independent soul, easy going, very quiet, and seems house broken. She is great in the car, good on lead, good with kids and very cat friendly. A sweet girl that is coming out of her shell now that she feels safe. She does not mind dogs, but seems to get very nervous when they get into her space. We think she would feel more comfy as an only dog, or a another laid back independent dog. She would be a fantastic dog for our local city dwellers! 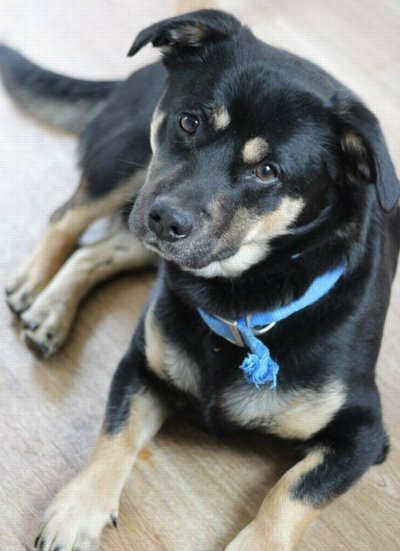 Raven is looking for a very special person -someone who might want to give this boy a chance - with the support of PWD. He is safe at PWD until he finds that person.